What do you get when you combine modern technology, rich history and a diverse community? The new OC Streetcar! This 4.15-mile system will have 16 stops, running along a combination of city streets and dedicated track in the historic Pacific Electric Interurban right-of-way. It will provide vital connections between the many diverse neighborhoods in the community and the ever-vibrant downtown Santa Ana, full of small businesses and entertainment, Santa Ana’s bustling Civic Center, which serves as the county seat, and countless schools, churches, parks and other businesses. We were specifically hired to design the streetcar stops—an important task because it is where riders have their first interaction with the streetcar and form many of their perceptions. We wanted to create something that the community could be proud of and embrace as its own. We figured the best way to achieve this would be to involve community members as much as possible, which is just what we did. After winning the bid, we spent two months in an information-gathering phase, researching the rich and diverse history of the region and talking with residents to understand the pulse of the community. We were blown away with the history of this area. From its early days, Orange County has truly been a place for opportunity and ingenuity. Spaniard settlers made it their home in the late 1700s, citrus farmers made their mark around the turn of the 20th century, and now, it’s become a remarkable hub for small businesses, with tremendous foot traffic and accessibility. These two cities have so much to offer with their diverse make-up and thriving cultures, and we knew we had to somehow capture that vibrancy in our design. So, we conducted neighborhood surveys and participated in stakeholder working meetings and multiple community meetings to get as much input as possible. Without fail, we walked away from every meeting with a new piece of feedback that informed the design. We started to collect as many words and phrases as we could to describe the people, the community and the neighborhoods through which the system would run. These came from internal research and brainstorming, surveys and discussions at community meetings, and a day-long design charrette with the client and local city planners. We posted the hundreds of 3x5 index cards with words and phrases on the wall to see the bigger picture. This exercise inspired the first three distinct designs for the stops that all revolved around community, diversity, vibrancy and the area’s entrepreneurial spirit. Where we landed with the conceptual stop design, with guidance from OCTA, is truly a collaborative effort. It meets the need for modern urban transit, creates comfortable and safe spaces for riders, and reflects the local region that it serves. The stop design is dynamic and elegant in its simplicity. The painted steel shelter structure is very open with a gently curving translucent canopy, reflecting the openness of the community, while enhancing visual security as much as possible. The design does not take away from local businesses or the vibrancy of the surrounding neighborhoods. Potential personalization within the canopies will reflect each particular neighborhood’s history and culture, while the bold OC logo and timeless design create an identifiable brand for Orange County. 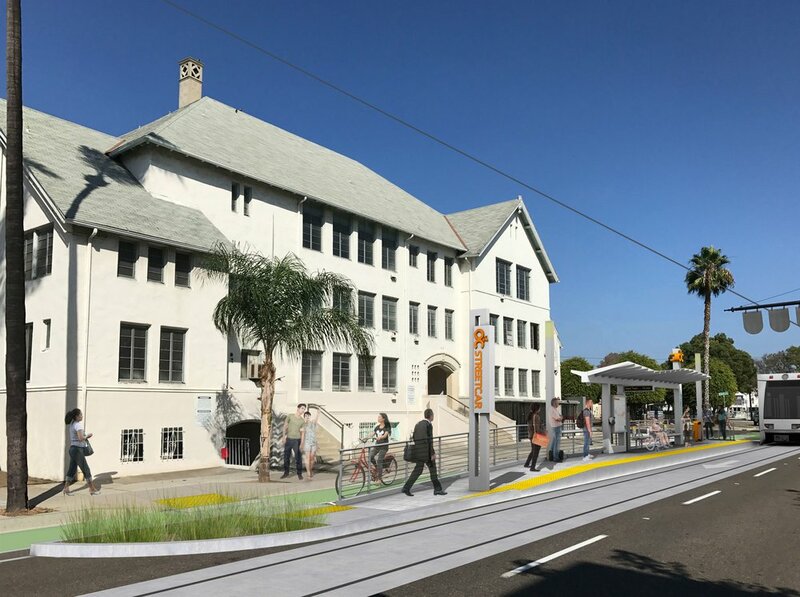 While the OC Streetcar system isn’t set to start service until 2020, the groundwork has been laid and design is well underway. We’re excited to see our team’s hard work manifest into something that will truly benefit these residents and connect neighborhoods in a way that could strengthen the economic and community-centric vitality of this historic area.